Founded in 1780 by John Jameson, the Old Jameson Distillery operates as one of Irelands' top visitor attractions offering guided tours daily. The perfect place to start when considering places to visit in Dublin. The Old Jameson Distillery in Bow Street Smithfield Dublin is one of the most interesting place to visit in Dublin, it is an Irish whiskey tourist attraction located just off Smithfield Square in Dublin, Ireland. The original home of Jameson Irish whiskey since 1780, the Old Jameson Distillery has stayed standing through rivalries, recessions, prohibitions and civil wars. The OJD experience invites visitors to explore the storied history behind Ireland's most famous whiskey in an original building of John Jameson's once-sprawling headquarters. As well as delving into Jameson's past, visitors are given a guided tour of the production process and learn the secrets behind the triple-distilled taste. Of course whiskey is made to be enjoyed, so every tour concludes with a comparison tasting in the Jameson bar, followed by a signature Jameson Ginger & Lime drink for guests to enjoy. Book Online to receive a 10% discount on adult admission! For the true whiskey advocate! Enjoy a dedicated hour long classroom style introduction to the craft, production process and taste from four of the Jameson whiskey family. Allow the Jameson whiskey experts to guide you through the subtle differences between Malt and Grain whiskey, Distillation and Maturation while savouring 4 samples from the premium range including: Jameson Original, Jameson Distillery Reserve, Jameson Black Barrel, and Jameson Gold. All guests receive a coveted Jameson Masterclass tasting certificate and a complimentary gift once inducted into the Jameson story. Available Fridays, Saturdays, & Sundays from 2.00, 4.00, and 6.00 pm * subject to availability and guests can purchase the next class on arrival to the distillery. The Bow Street Distillery in Dublin's city centre is just three minutes walk from the red LUAS Smithfield stop and ten minutes walk from The Guinness Storehouse , Temple Bar and O'Connell street. The Old Jameson Distillery is home to an exclusive Jameson gift shop where you can purchase unique Jameson gifts or even bottle your own cask strength Jameson Select Reserve. Some of the country's biggest names have already joined forces to deliver one-off shows in the iconic surroundings of the Old Jameson Distillery in Smithfield. With remarkable collaborations, new arrangements, fresh interpretations and other surprises guaranteed, some of the most unique nights of entertainment in the capital await. There are plenty of live entertainments, performances, festivals and events in this wonderful distillery in the heart of Dublin. You can click here to view their up-to-date events and entertainments, the line up for live bands and performances. 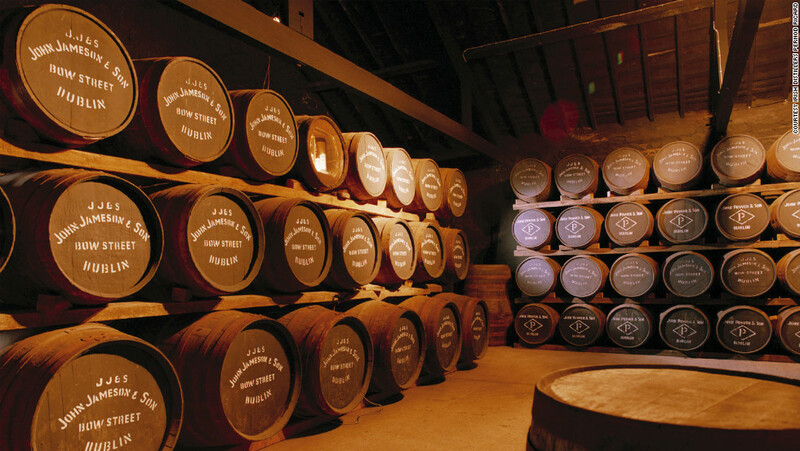 Click to View Trip Advisor Reviews for the Old Jameson Distillery!